Spook-tacular Fall Events and Resources! Nothing scary here but Formed Families Forward is so busy we may be a little batty! Here are some Halloween-themed notices about our upcoming trainings and events. Need a web of support for your teen, young adult, or yourself? October marks the start of our 5th year of Stronger Together peer support groups. Twice monthly, two groups- one for parents and caregivers and another for youth and young adults age 14-22- meet to offer and receive peer support. Both groups are led by licensed clinicians and we provide a light dinner for all. The groups are free to attend but please REGISTER! Haunted by concerns about opioid abuse on our community? On October 29, become part of the solution! Formed Families Forward is pleased to host Fairfax Community Services Board for a REVIVE! Opioid Overdose and Naloxone Treatment trainin g workshop. Learn more about opioids, how opioid overdoses happen, risk factors for opioids overdoses and how to respond in an emergency with naloxone (Narcan). Training is free, at our offices in Fairfax city, REGISTER HERE. Virginia for an evening workshop, Girls with ADHD: Strategies for Supporting and Advocating for Our Daughters on Thursday, November 8 at 6:15 PM at our offices in Fairfax. The session will address unique characteristics that impact identification, delivery of services and parenting of girls with ADHD. We will review recent policy guidance that impact the eligibility for school and post-secondary accommodations and supports, and offer practical strategies for parenting and advocating for girls with ADHD/ADD. 26, FFF sponsors a W.I.S.E. Up training for adoptive families (parents and school age children grades 1-6). in Leesburg. This proven curriculum, designed and delivered by the Center for Adoption Support and Education (CASE), teaches adopted children and their parents how to deal with their feelings about being adopted while responding to others’ questions, comments and curiosities. Using a set of W.I.S.E. Up strategies, families gain power to manage their responses. Typically offered for a fee, this evening session is available FREE of charge, but families MUST PRE-REGISTER! The 2nd Annual Virginia Adoption Conference is less than a month away! Celebrating and Sustaining Families Through Adoption is open to child welfare and other professionals as well as family members. The Conference hosted by the Virginia Department of Social Services and NewFound Families-Virginia, in co-sponsorship with the North American Council on Adoptable Children, will be in Glen Allen and concludes with a half-day respite event for families. Conference REGISTRATION is FREE. Survey Says: You have the Power! Parents/primary caregivers often help their adult children with intellectual disabilities (ID) have romantic relationship experiences (such as dating). Researchers from Michigan State University are looking for a nationwide sample of parents who have an adult child (age 18-30) with a mild/moderate intellectual disability. Study participants will be asked to complete an anonymous 20 minute online survey for the chance to get a $50 giftcard. Study participants will also have the option to participate in a phone/online interview and will be given $30 for the interview as well. Learn more about this study HERE. Responses from all families, professionals and community members are requested in this brief survey about kinship care, from researchers from Catholic University of America. Share your opinions and knowledge about kin caregivers who care for relative children and youth. Help shape policies and programs to strengthen kinship care in our region! Learn more HERE. Q: The oldest of my three adopted children is going to enter middle school next year and she has an IEP. I heard from another mom that we have to pay attention NOW as the courses we select can impact her graduation. What gives? A: Yes, despite how young your child is, it is important to be aware of the implications of course selection, state assessment choices and other decisions on diploma options. The Virginia state requirements for Standard diplomas can be found HERE, and for Advanced Studies diplomas HERE. Note that these have changed for students entering 9th grade for the first time in 2018-19 and beyond. World languages: students pursuing an Advanced Studies diploma need three full credits of one world language. Math: students pursuing a Standard Diploma must complete three standard credits to inclue at least two different course selections from among: algebra I, geometry, algebra functions, and data analysis, algebra II, or other approved math courses. Some "courses" may be split into two parts over two years, such as Algebra 1 part A and Algebra 1 part B.
SOL assessments generally must be taken and passed by students pursuing Standard and Advanced Studies diplomas. Testing accommodations may be available. If your student is not set to take SOL assessments, there may be limitations on what diploma can be earned. Ask questions about the implications of choosing a route to an Applied Studies diploma. The Virginia Department of Education (VDOE) is offering training to parents of students with disabilities on critical decision points that can affect a child’s ability to earn a diploma and be ready for higher education or a career. The November training session in Manassas has filled but additional training should be available later in the school year. 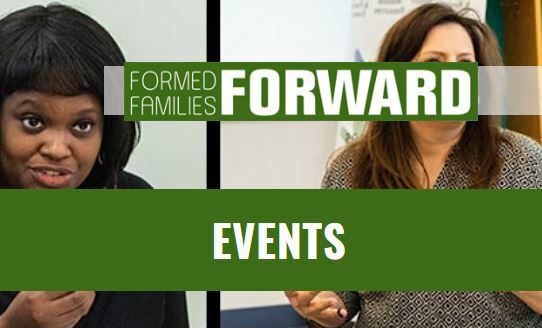 As always, Formed Families Forward is here to help foster, adoptive and kinship families navigate education policies and procedures. Contact us! "Goblin" down some great regional training! It is easier than ever to find our and others' trainings on our website calendar. Just click on the EVENTS tab! October 10 - Kinship Cafe, hosted by Fairfax Kinship Family Institute, Fairfax. October 13- Loudoun County Public Schools Mental Health Symposium , Ashburn. FFF will be there! October 13- Arlington Public Schools Dyslexia Conference, hosted by the Arlington Public Schools Parent Resource Center, Arlington. October 17- Moving On To Life in the Community: A Resource Fair for Students with Disabilities, hosted by Fairfax County Public Schools Parent Resource Center, Burke. October 19- Screening of Angst: Raising Awareness Around Anxiety documentary and panel discussion, morning session and evening session. Hosted by ADHD Resource Group of Northern Va, Fairfax. October 20- ADHD Awareness Month Resource Fair, hosted by CHADD, McLean. October 24- Managing Challenging Behaviors in Teens, hosted by Alexandria City Public Schools Parent Resource Center, Alexandria. October 24- An Integration of Legal and Financial Planning: Post Secondary School through Retirement - What You Need to Know, hosted by ServiceSource, Oakton. October 29- REVIVE! Opioid Overdose and Naloxone Education , hosted by FFF, Fairfax. November 3- Circle of Support conference, hosted by The Arc of Greater Prince William, Woodbridge. November 14- Kinship Cafe, hosted by Fairfax Kinship Family Institute, Fairfax. recreation and respite program for adopted children ages 10-15 who have special needs. Open to Fairfax County residents who have adopted via public or private agencies. Interested? Contact FFF at info@formedfamiliesforward.org and we will connect you!